This weekend though wasn’t filled with fishing adventures like usual. It was filled with other fun happenings. Now don’t worry the boat wasn’t neglected. Hubby and J worked on putting new seats in the boat. Looking forward to trying them out this coming weekend. Anyways Saturday morning came bright and early. The hardest part of this that take place early in the morning is I don’t sleep well. I always have nightmares that I slept through my alarm or got lost trying to get to my destination. Terrible. But after a very restless night. I was up early doing all my morning farm chores. So we could head out to our 5k. Chores done and inside to get ready. I bought compression socks this time around and special insoles for my shoes. After my last 10k I had really done a number on my shins. And did not want a repeat. Race started at 9am. This was J’s first official 5k. He sped past me at the beginning. Then slowed. Took some coaxing to keep him going. Walking here and there. But after 36 mins we crossed the finish line. Not my best time But it was worth getting to run with J. We plan on doing another one together this year. This time a bit more training is in store. We then headed to our fav cafe for a bite to eat. Next we headed home to rest up before the parade. Where I ended up taking a nap. Getting old ha! After said nap. I got up did chores and off to the parade we went. It’s not a huge parade but it’s fun. J got a lot of candy from it. Not sure which he enjoyed more the candy or the parade. I’m leaning towards the candy. Next was the rodeo. I’m a bit disappointed with that. It wasn’t very good. The riders did well. Just wished there had been more contestants. And the entertainment they had was nothing to get excited about. The clown they had wasn’t funny he was very vulgar. I didn’t like that. Once the rodeo was done our day had come to an end and off to bed we went. Sunday was chore day. We went and picked up plants for the garden (tomatoes and peppers. Then some flowers for the flower beds in front of the house) as you read and seen in my prior blog. We also got parts for the boat so the guys could put the chairs in. Once home we began working. Stopping to chase ducklings as we had people coming to purchase them. 6 sold to one guy who had two muscovy drakes already. And needing some hens. The next 12 went to a fella wanting to raise them to eat. I had to enlist hubby and J to help wrangle baby ducks. Let me tell you trying to grab a tiny fluff ball is no easy task. Nor is it enjoyable to hear the moms calling for their babies:( breaks my heart. But there’s no way I can keep all the babies. I’d become over run with ducks. Though I’d have less bug issues. Speaking of bugs. Just the other day I was talking to hubby about how I never see lightning bugs anymore. I remember growing up and having an abundance of them. Going out and catching them. So you can see them light up in your hands. I hadn’t seen any in years even when we lived in our trailer in town. Nothing. Then just the other night there was 1 just 1. But it was the most amazing moment. I got J’s attention so he could see. Alright back to Sunday. After ducklings were off to their new homes. Chores done. Dinner made and ate. Then watered the gardens. Which turned into playing in the water with J. I think he ended up watered better then the plants ha! It was a fun and productive weekend. Thus week doesn’t appear to be any less busy. Today we are working on cleaning out the grainery/straw barn. T-ball later. And picking up our newest farm member. With that said I best get going so we can perhaps get the barn done today. P.s. 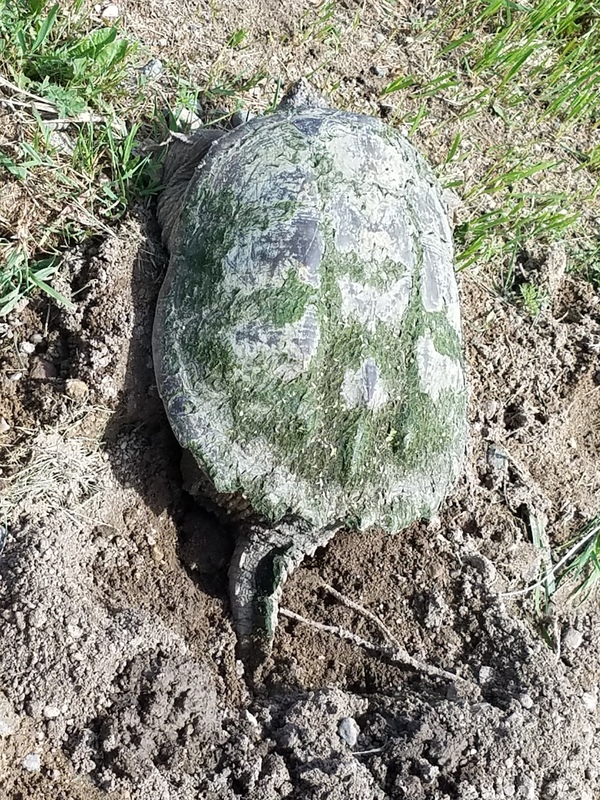 we also seen this big snapping turtle yesterday. 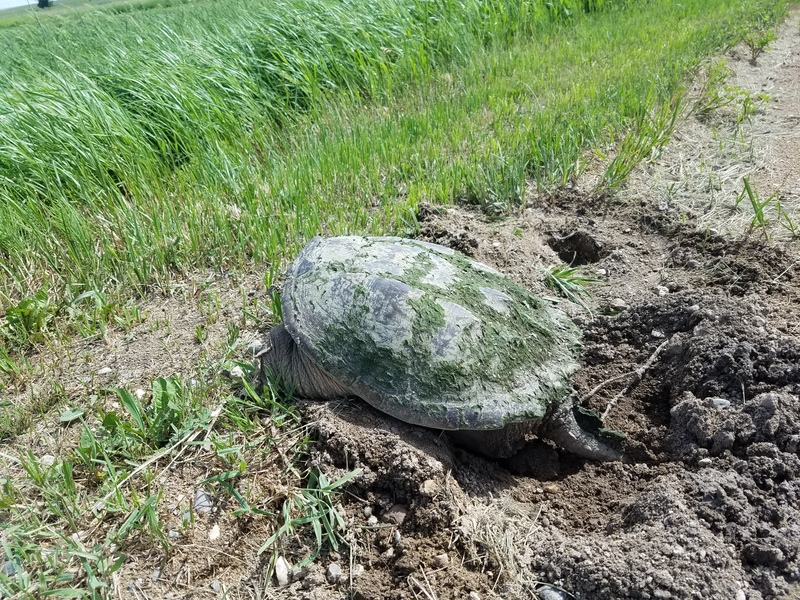 Laying her eggs on the side of the road. Author WeekendWarriorOutdoorsPosted on June 12, 2017 Categories ducks, Family, farm, UncategorizedTags 5k, Busy weekend, ducks, Family, farm, parade, rodeoLeave a comment on Busy weekend.